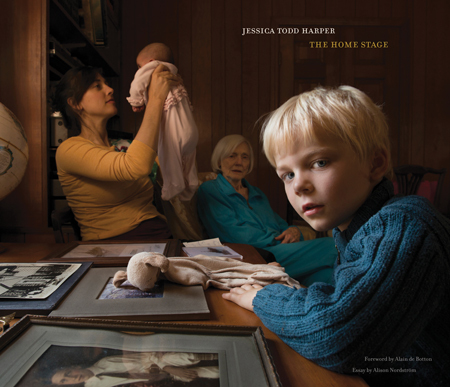 Book Review The Homestage By Jessica Todd Harper Reviewed by David Ondrik The Home Stage is a tender book of family photographs that refine the personal style of Jessica Todd Harper’s first book, Interior Exposure. In The Home Stage, the domestic scenes of twenty-somethings have morphed into domestic scenes of newish parents adapting to life with children. The Home Stage. By Jessica Todd Harper. Damiani, 2014. 112 pp., illustrated throughout, 11x9½". The Home Stage is a tender book of family photographs that refine the personal style of Jessica Todd Harper’s first book, Interior Exposure. In The Home Stage, the domestic scenes of twenty-somethings have morphed into domestic scenes of newish parents adapting to life with children. The images are so well done that they should engage even those who are not usually seduced by pastoral photographs of charming urchins and glowing parents. The Home Stage. By Jessica Todd Harper. Damiani, 2014. By taking on motherhood and domestic life, Harper is working with a timeless subject that pulls at something deep in the human psyche. Her mother and child portraits smartly reference and build upon the tradition of such images in Euro-Christian art. Self Portrait with Marshall, 2008 is a traditional example, while Becky and June (in my old bedroom), 2013 is an endearing, modern adaptation of the familiar archetype. The one serious deviation from the formula of cherubic toddlers is Papa with Mom, Becky, etc, a moving image of a dying elderly man surrounded by family, including a wailing baby. It’s the image I linger on the most, and leaves me wanting to see more of The Home Stage beyond the very young. Because this is how our brains work — or my brain anyway — comparisons with Sally Mann’s Immediate Family are inescapable. The forward by Alain de Botton halfheartedly attempts to distance Harper’s work from Mann’s, but ultimately The Home Stage is more sentimental and less sensual than Immediate Family. It’s about as far from controversy as an artist can get. A small selection of images, such as Abby Sees Hugh in the Front Hall, 2013, can be compared to Julie Blackmon’s digital-illustrations of domestic life, but without the menacing undertone. The physical book itself is somewhat disappointing. There is occasionally banding in the lighter areas of the images that is reminiscent of an ink jet printer with a misaligned head. This is likely due to “efficiencies” in the print-publishing world that are outside the artist’s control. My review copy also has paper dust along the top of nearly every image. Although it comes free with vigorous rubbing with a soft cloth, it’s annoying. DAVID ONDRIK is an artist, high school art teacher, and writer who grew up in Albuquerque, New Mexico and now lives in Portland, Oregon. http://www.artisdead.net.